The Amazing Spider-Man 2 came and went. It had some good moments but also some cringe worthy one liners...especially with Electro and The Green Goblin. 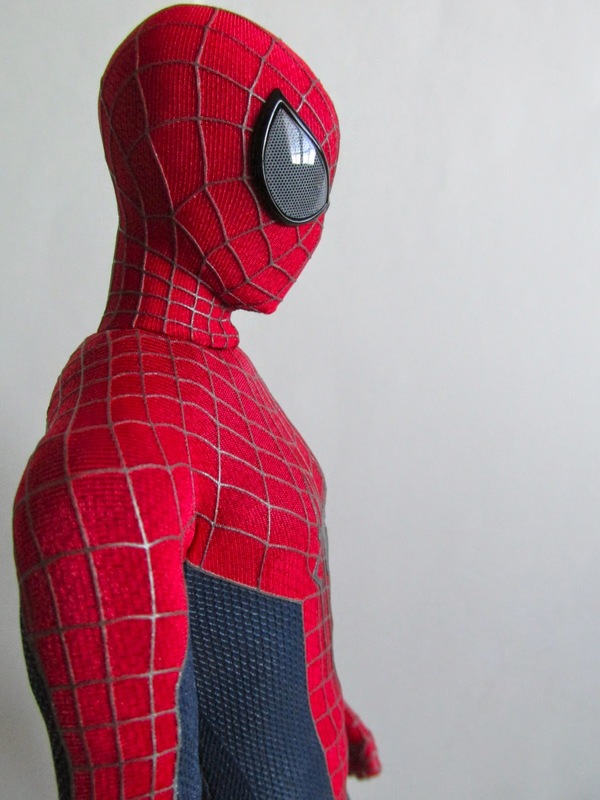 The best thing that came from this movie was Spider-Man's costume. 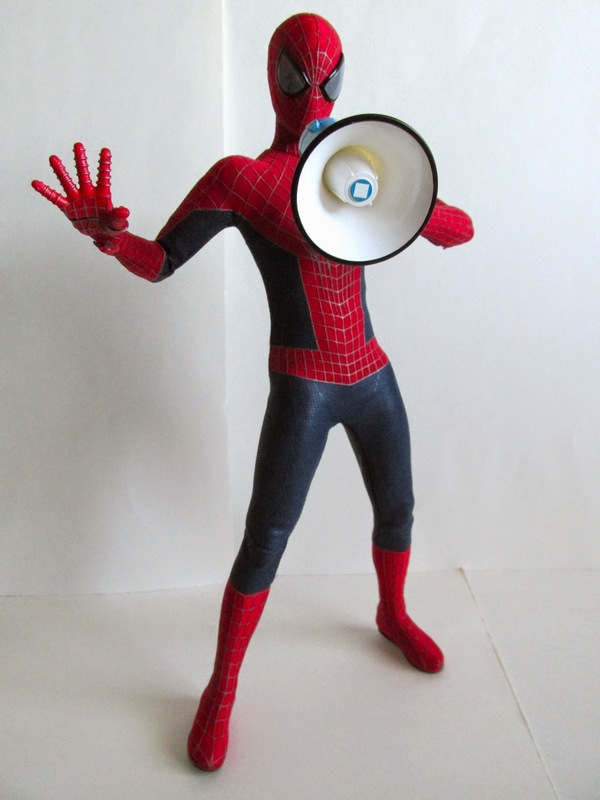 This is probably the best representation we have had of Spider-Man's iconic costume. 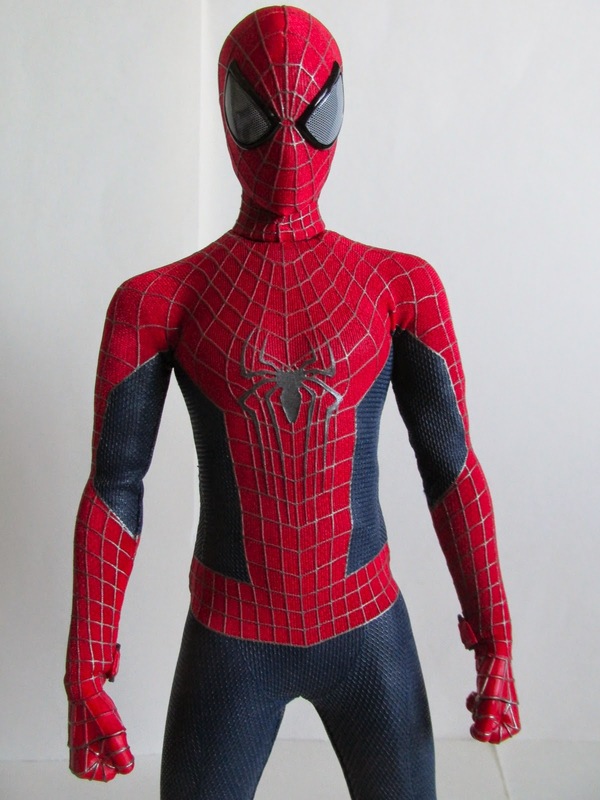 The Sam Raimi films had a great costume, but The Amazing Spider-Man 2's costume adheres to more of the comic book look. I'm very impressed with this Hot Toy and amazed at how good this actually came out. The costume has the honey comb pattern lightly done and it feels like what you would expect it to feel. 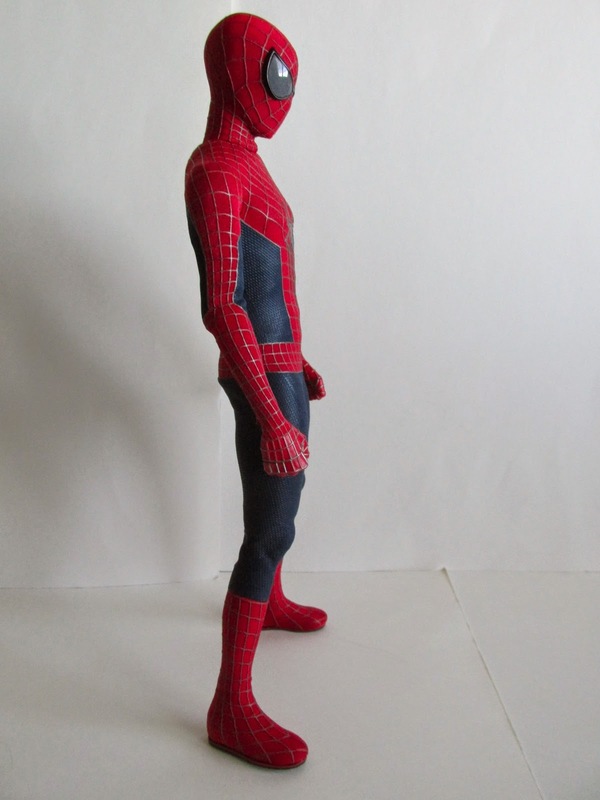 Understanding that Spider-Man would be put in extreme poses, it seems Hot Toys has improved on the durability of the costume and it feels more strong compared to past Spider-Man releases. 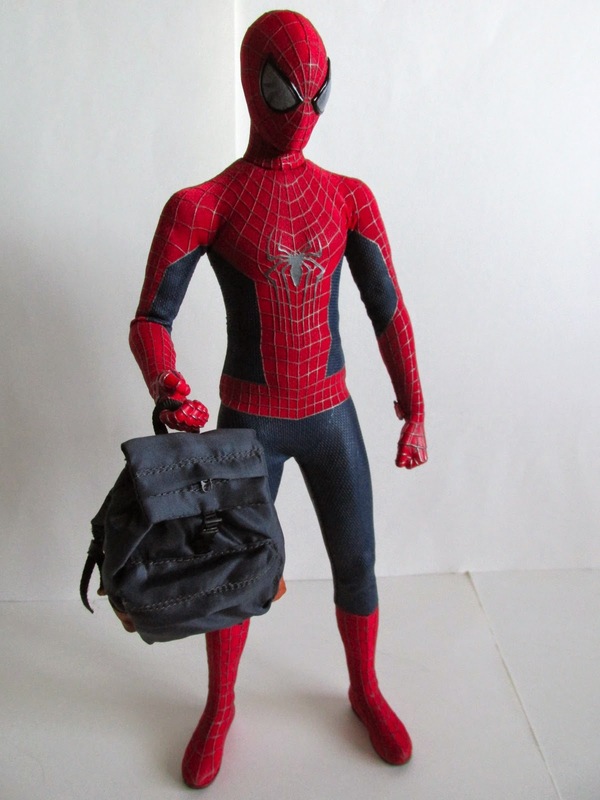 Hot Toys also used a great slim yet lean body this time around, and it looks the way one would expect Peter Parker to be like. 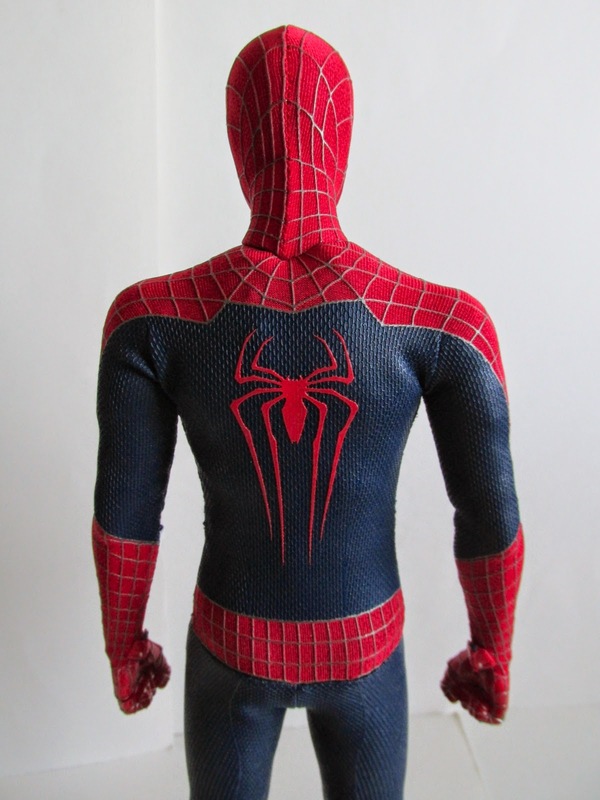 Along with the great costume, the slim body is the perfect compliment to Spider-Man's over all great look. 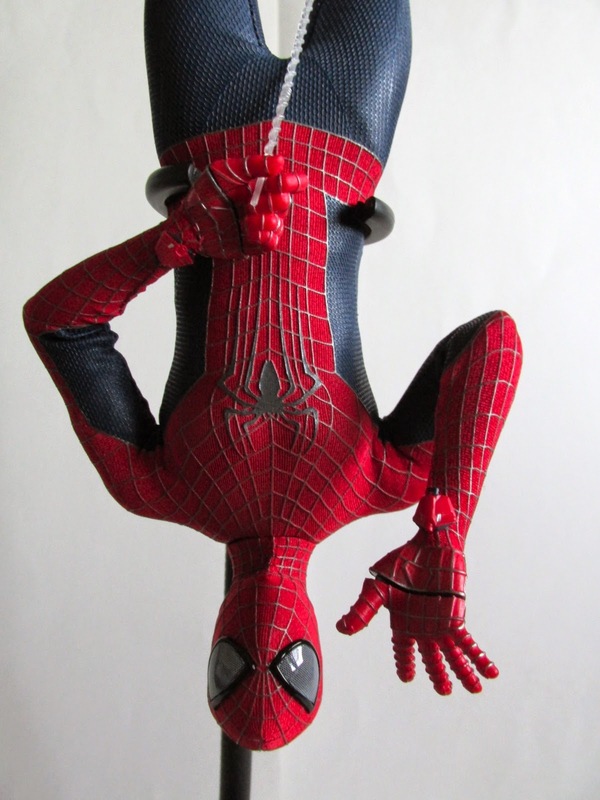 Even though the costume is more durable, I'm still hesitant to put him into the extreme poses he is known for simply because I don't want to cause any wear and creases where his joints are. Putting the figure in an extreme pose for long periods of time can cause unwanted damage. I've also noticed that trying to crouch the figure will cause the costume itself to slightly get off centered...good luck trying to put that back into place. 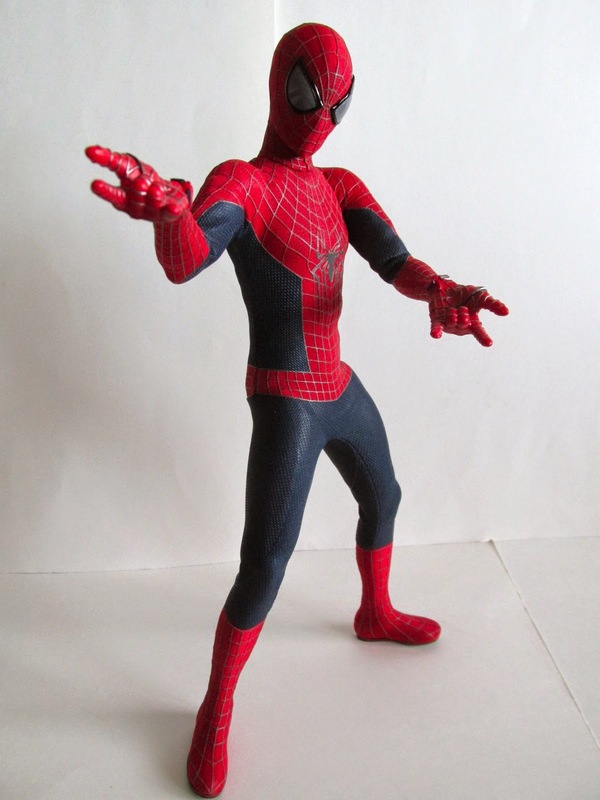 Another great new addition to the Hot Toy's line are the magnetic fingers. Instead of switching out the whole hand, you know just switch out the fingers that are attached by magnets. I'm really digging this new way to switch out hands, and it is not as frustrating as switching out the whole hands with the peg attached like past releases. He may come with a lot, but his accessories are kind of meh. 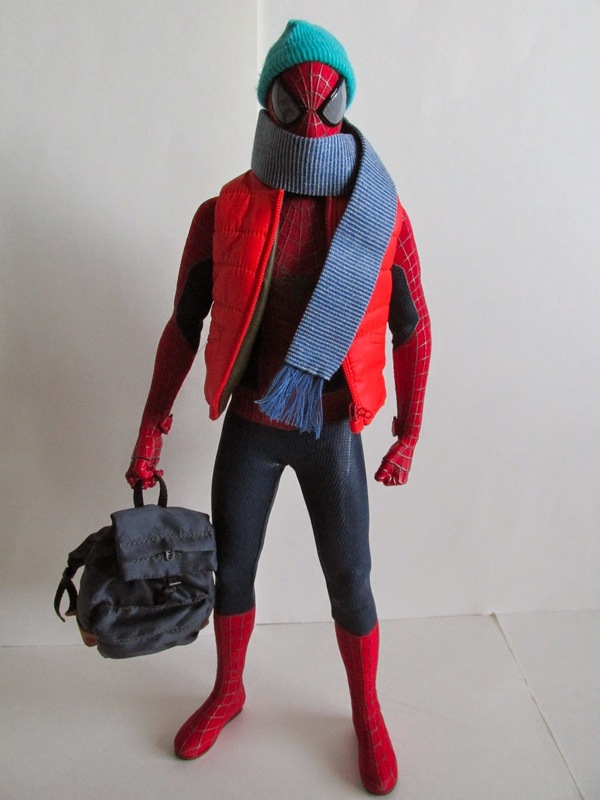 He comes with a whole slew of fingers, megaphone two web lines, two web lines with a rounded end, orange vest, blue scarf, turquoise beanie, back pack, dynamic base with switch out base cover, and the Sideshow Exclusive plutonium canister. I'm sure you are thinking, "Wow this came with a lot of great accessories!" 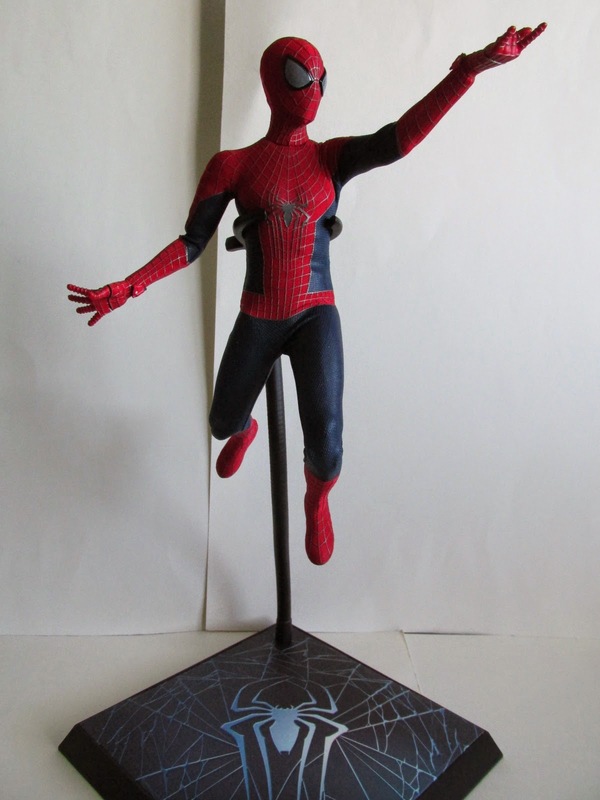 While they are cool pieces, they aren't exactly props I would display with Spider-Man. The back pack maybe to give the illusion he pulled his costume out of the back pack. 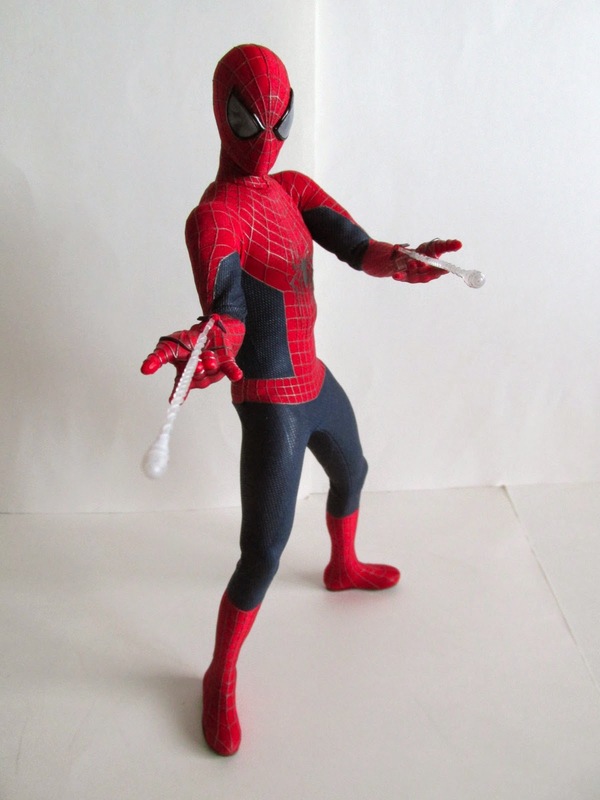 The other pieces though don't really define Spider-Man, and I prefer to pose Spider-Man in an iconic pose rather than display him with his costume change when he got a cold that lasted for a second in a 1 minute montage. Overall, I am very happy with this figure. 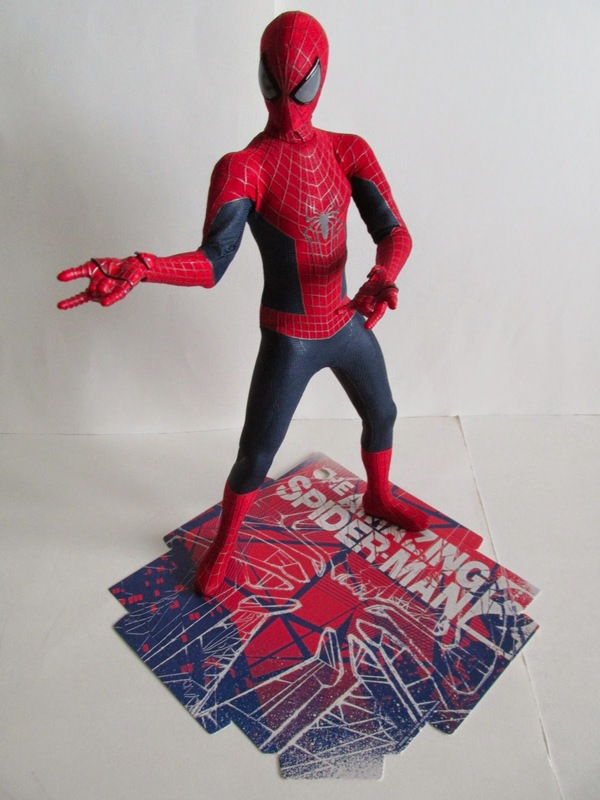 He looks great and captures the iconic look of Spider-Man that everyone knows and loves. 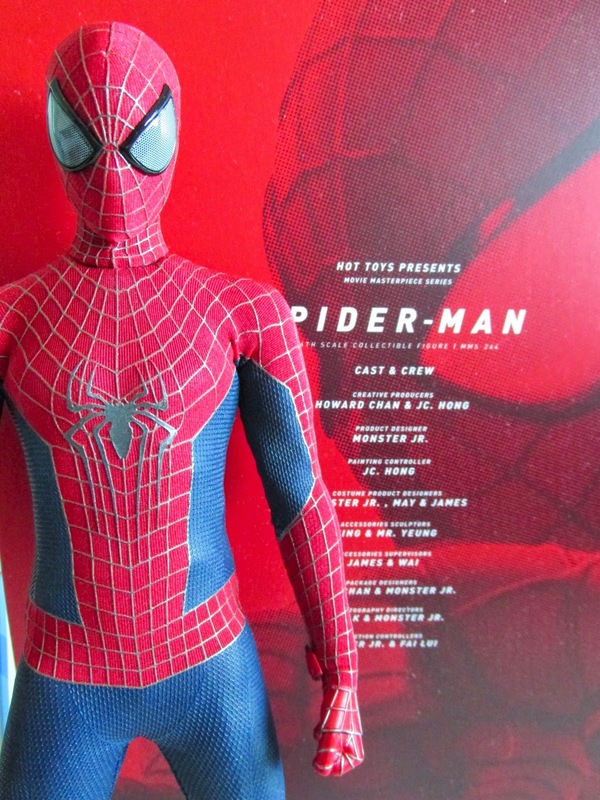 Definitely a center piece to any collection especially because of the fine accuracy Hot Toys is known for. Spider-Man fans should not hesitate with this one. 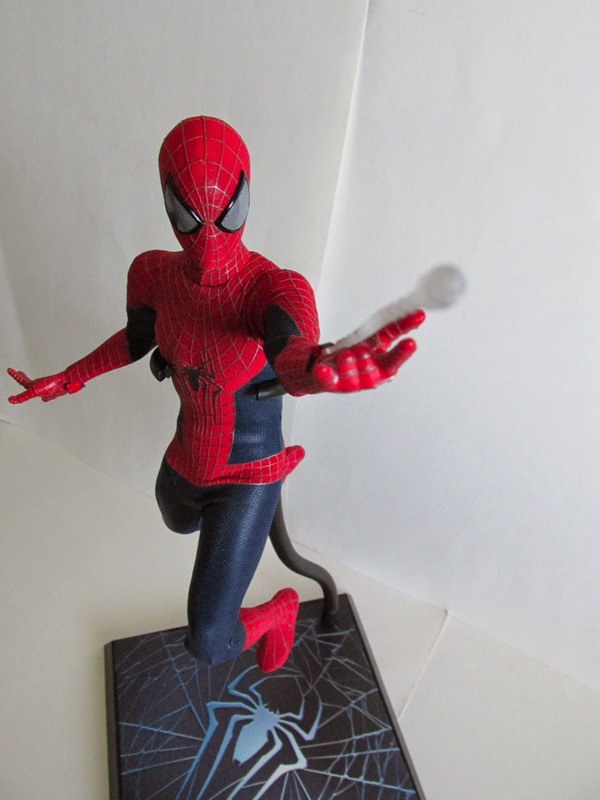 The Sideshow Exclusive is on wait list but you can still get the non exclusive at Sideshow Collectibles. You aren't missing much honestly.